I am one of those people who can’t handle being pale. I curse my pasty white skin because it makes it so hard for me to tan in the summer and I just feel like clothes don’t look as good on me (also because I’ve gained 25 “love pounds”, none of my clothes fit…but that’s a story for a different time). Don’t get me wrong, I am not saying pale skin is ugly, I just don’t like being pale myself. I have seen women with the most beautiful fair skin and I wish I could pull it off, but personally I feel more confident and better when I have a tan. Now, unfortunately, living in Vancouver, BC makes it impossible to get a natural tan all year round unless I am constantly flying to tropical places, which I definitely can’t afford (yet). Also, with the amount of moles and beauty marks I have, stepping into the tanning beds is a big no-no. So, what am I left with if I want glowing skin? Self-tanner! There are so many different brands out there to choose from and trust me, I have tried most of them. I will go over the brands and products that I have used and the pros and cons of the various types of products out there. First off, I will start with my beginner tanning products. The ones I tried after being told I had to stop going to the beds by my doctor. I literally was going 6 times a week and after having to get a newly formed mole removed because they thought it was cancerous (thankfully it wasn’t) I decided maybe it was time to try out the creams. I started with drugstore brands like Jergens, Life, and Oil of Olay. These brands at the time came out with lotions that gave the person who used them a gradual tan. I liked the end result of these brands for the price I paid, but they did not smell the greatest. I am not sure if the formulas have changed at all since then as this was 10+ years ago, but back then the scent was similar to olive oil. At least thats the only way I was able to describe it. The tan that these brands gave me did not leave my skin looking orange, but rather it gave a natural looking glow. The other thing I liked about these products, from what I can remember, is that there was not really any transfer onto my clothes. Again this was 10+ years ago so I am not aware if the brands have changed their formulas so that they are better or not as good. Maybe soon I will do a review of them as I would like to try them out to see if there have been any changes. Eventually I stopped using the gradual tanners and upgraded to the more expensive St. Tropez brand as they had a 4-hour express dark tanning mousse. This mousse was interesting. I have to admit, the application mitt that this brand sells is amazing and I still to this day use it for any self tanning brand I use. I switched over because I am a highly impatient person and I like to see quick results. Needless to say, I was impressed with the dramatic result of the tan, however there were a few misses from this brand. St. Tropez tanning products were brought to my attention by co-worker and she always had such nice, glowing skin. She recommended the brand and claimed it was the best, so I had to try it for myself. At first, I loved it. I would put it on at night and instead of washing it off after 4 hours, I would sleep with it on. I would wake up, shower, and have glowing skin for at least a week and a half, or so I thought. My girlfriends quickly notified me that it was a bit orange looking and splotchy (it sounds bitchy but I would rather the honesty then to walk around looking like an oompa loompa). I thought, maybe I did not loofah enough before putting it on, as the instructions said to exfoliate your skin before application. Nope, this did not help. I figured I got a bad bottle so I exchanged it for a new one because it was only a week and a half and I had only used it once. I got home, hopped in the shower to loofah my life away and apply it again. This time it worked well. I used it for a while, until one day I noticed it was turning my skin orange again. I heard they had changed the formula so I stopped with that brand as I figured it was clearly meant for people with more of an olive tone, whereas I have more golden undertones. On to the next brand, I thought. So I waltzed in to Sephora, determined to walk to of there with an amazing product that I had heard so much about, Vita Liberata. This brand is actually amazing, but with a bit of a price tag. At $65CAD, the pHenomenal 2-3 week tanning mousse had better be worth it, I thought. I had heard great things about it and I was blown away. It was the same idea as the St. Tropez in the sense that I would loofah in the shower before applying, leave it on overnight, and in the morning, rinse off with warm water in the shower. I stepped out of the shower after the first application and finally had the tan of my dreams. This product was amazing and I used it for so long before I realized it was a bit too expensive for me. Thankfully the bottle lasted a long time, even though I used it once every week and a half. The tan did last about 2 weeks, but I had a need to be as tanned as possible. This product even worked well on the face without causing breakouts, which for me was a huge bonus because I did not need to buy the face tanner. To this day I highly recommend this brand, the only reason I stopped using it was because of the price. 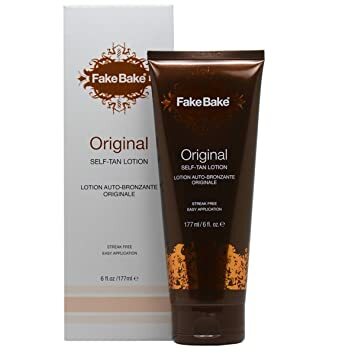 More recently, I started using a brand called Fake Bake. This has been my absolute favourite brand to use for self tanner and I will never look back. I am open to trying other brands, but this one just stuck with me as the best one. I heard about this brand thanks to my best friends younger sister who does amazing spray tans, and when I went into the beauty supply store to grab some hair products, I noticed they sold some of their products. It was so inexpensive that I grabbed a bottle of the Original lotion to try out. It was absolutely amazing! Not only did I get little to no transfer on my clothing, The tan was pretty perfect. The application was simple and lasted longer than expected! I applied it with the gloves that came in the package after exfoliating in the shower, let it sit overnight, and rinsed of in the morning and was left with the most amazing glow. I had finally found my holy grail tanning product! 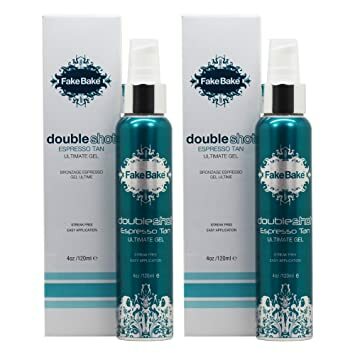 I also bought the double shot espresso tanning lotion that Fake Bake makes, but found I did not like it as much. I actually use it mixed in with my body lotion and apply it with a tanning mitt when I am out of the original lotion and can’t make it to the supply store to get a new one. This brand works so well and I recommend it to everyone! I have to say though, I have only ever seen it at West Coast Beauty Supply, which is only available to people in the beauty industry (i.e. makeup artists, hair dressers, aestheticians, etc.) and I am not sure where else you can get this product other than on their website, but it is so worth the order. Given all this, I have to say that self-tanning is personal and certain brands will work differently depending on how fair you are or if you have golden, olive, or even pink undertones to your skin. It also depends on whether or not you would like a product that offers a gradual tan, or something that is quicker with the results. Either way, I find that it is trial and error when it comes to products until you find your perfect match. I am happy to say that I found mine and I am beyond happy with the results I get. Please also read the instructions for products carefully before applying or even purchasing. I always exfoliate before I use any self-tanning product and I make sure to apply with a mitt or gloves in circular motions. Also, never use too much on the hands, feet, knees, armpits, or elbows but rather lightly go over those areas because they will become darker than the rest of your skin. Thank you for reading and leave a comment below to let me know your self-tanning experiences and what brands work best for you! As always, please subscribe to the blog to be notified of new posts weekly and follow me on social media for daily photos and posts! Ever since I was little, I was told to always wash my face. I struggled with acne in my teens and as an adult in my 20’s as well. Now, I’m approaching 30 faster than I could imagine (less than a month to go) and I decided to drastically change one thing, washing my face. Now, before you decide I’m gross for not washing my face every day, hear me out. I still wash my face, just about as much as I wash my hair (twice a week) and I don’t just leave all the dirt and oil that has accumulated into a layer on my face to sit there until the day I wash it. You have to understand that after about 15-20 years of trying desperately to hide the giant pimples and trying every product under the sun to get rid of them, I hit a breaking point. I read somewhere (honestly I can’t remember where now) that washing your face twice a day, let alone once, is actually not good. At first I thought it was a joke, but figured, what is the harm? I’ve exhausted everything else, so I tried it. What made it easier was summer. I barely wear any makeup during the summer unless I have an event to go to, and even then, I got my lashes done so I didn’t wear too much eye makeup. Wearing makeup was the only part that made it difficult, the odd time I did wear any. Day-to-day I would just use Micellar Water and toner to remove any dirt and oil that regularly gets on the face from the general environment, then apply sunscreen as a moisturizer for daytime, and my prescription acne cream for spot treatments at night before bed. I have been doing this now for about a month and a half and I have to say, it has worked wonders on my skin! The only difference when I wear makeup is that I use a baby wipe (because I’m ‘thrifty’ and don’t want to pay for makeup wipes when baby wipes work just as good) to remove the makeup and then micellar water, toner, and acne cream. Obviously this is not going to be a solution for everyone, but I definitely recommend trying it out! There are also some factors that I want to mention that could also contribute to my skin getting better. I do use a prescription acne cream with Retinol in it, which is mainly why I use sunscreen as a moisturizer during the day no matter what the weather (UV rays still come through in the rain and overcast). I have used the prescription cream since about April of this year and I only started this new routine a month and a half ago at the beginning of August. Since I started this new routine is when I noticed significant changes, even after I had already been using the cream for months. Below is a picture of my skin without any makeup on (except for my eyebrows being done), and no filter. My skin is not perfect, but has cleared up dramatically! When I do get any pimples, they go away quicker than they used to and are not as painful.